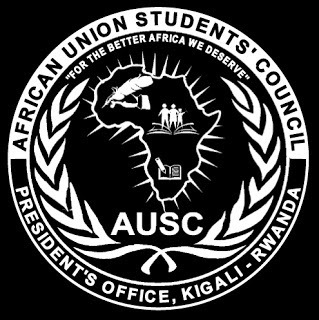 Dear beloved Leaders of African Union Students' Council (AUSC)"For The Better Africa We Deserve". We are very much exited to congratulate AUSC leaders who contributed in putting in action all activities enclosed in the periods of AUSC International Action Plan 2016-2019. It is very much important to remind you different activities included in it as shared below. In this regards, We taking this time to you that the closure of the 3rd period of AUSC International Action Plan 2016-2019 is approaching while We are soon going to shift to the AUSC International Action Plan 2019-2022. Therefore, as we are soon going to gather in Kigali-Rwanda for the 2nd All Afrikana First Youth Congress(2ndAAFYC2018) at Dove Hotel from 14th to 17th October, 2018, AUSC leaders all are invited to contribute in the 2nd AUSC International General Assembly to discuss 5 sub-themes below, and every one of AUSC Leaders is invited to contribute with different ideas. The following day is reserved for 2nd AUSC International General Assembly. 5) Receiving reports from different AUSC Chapters representatives and much more. However Dear AUSC Leaders, during this 2ndAAFYC2018, AUSC Leaders will be able to contribute on the closure of the 3rd Period of the AUSC International Action Plan 2016-2019 , while the upcoming AUSC International Action Plan 2019-2022 will be started with new AUSC International Executive Committee 2019-2022 which will be replacing the current AUSC International Transitional Committee 2016-2019. 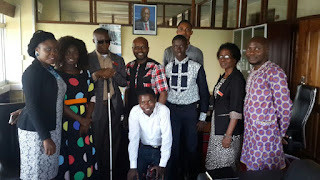 Therefore, new leadership of AUSC for the upcoming AUSC International Action Plan 2019-2022 on international level will be based on the ideas of all AUSC Leaders who will be present in the 2nd AUSC International General Assembly during this 2nd AAFYC2018 at Dove Hotel on 16th October , 2018 from 8:00 a.m to 2:00 p.m.
AUSC Leaders are invited to write to the AUSC president's Office via e-mail: ausc.president.office@gmail.com,to request for 2nd AAFYC 2018 Concept note and printable individual invitation where they can download those documents and write on their names to keep the memory of this great event. Keep revising the below AUSC International Action Plan 2016-2019 and share your resumes to contribute on the structuring the upcoming the AUSC International Action Plan 2019-2022. Congress concept note is available online , for your review and encouraging you to submit your abstracts in case you wish to share your experiences with other delegates during this congress and appearing in the 2nd AAFYC2018 Declaration. The registration is continued online for other delegates who are not registered in the AUSC Congresses delegates databases and you are as well invited to keep sharing this link ( https://goo.gl/forms/5T2buh98IMjuK4lM2). The AUSC congress divides its activities into three particular days with every day having its specific program , and finally produce the declaration that contains the overview of the whole congress activities where the 1st day is reserved from AUSC International Conference with AUSC members, leaders and non AUSC leaders and members as all delegates to the AUSC Congress participate with aim to discuss on different congress points as published in the concept note; the second day is reserved for AUSC International General Assembly where Only AUSC Appointed leaders are allowed to participate and discuss on the AUSC International Action Plan and share experiences from different AUSC Offices on International Level and plan for the next AUSC International General Assembly; and the 3rd day which is the last day of the congress is reserved for Touring for sight seeing and socializing with all delegates of the AUSC Congress and departure of delegates. We would like to share the link (http://www.africanunionsc.org/2017/10/the-1st-all-afrikana-youth-congress.html ) to the 1st All Afrikana First Youth Congress (1st AAFYC2017) that took place at Kigali Hill Top Hotel and Country Club from October 15th to 18th , 2017. In order to make easier the process to register for participation to 2nd AAFYC 2018 , all registration fess for the congress delegates will be waived to all who will not need to be hosted by the organizing committee of the congress. Thus, delegates will independently find accommodations, meals and transportation means during the congress period while attendance to the congress activities will be free of charge and no granted accommodations, meal and transportation facilities will be available for delegates who have not submitted the structured registration fee in the concept note as published online via the link : http://www.africanunionsc.org/2017/04/ausc-presidents-office-in-kigali-rwanda.html . Therefore, We welcome you all in this upcoming 2nd AAFYC2018 Kigali-Rwanda . AUSC Congress Organization Committee Team. The African Union Students' Council (AUSC)"For The Better Africa We Deserve"
Below are sub-themes that will be based on for plenary sessions and panel discussions on the 1st day of this congress. 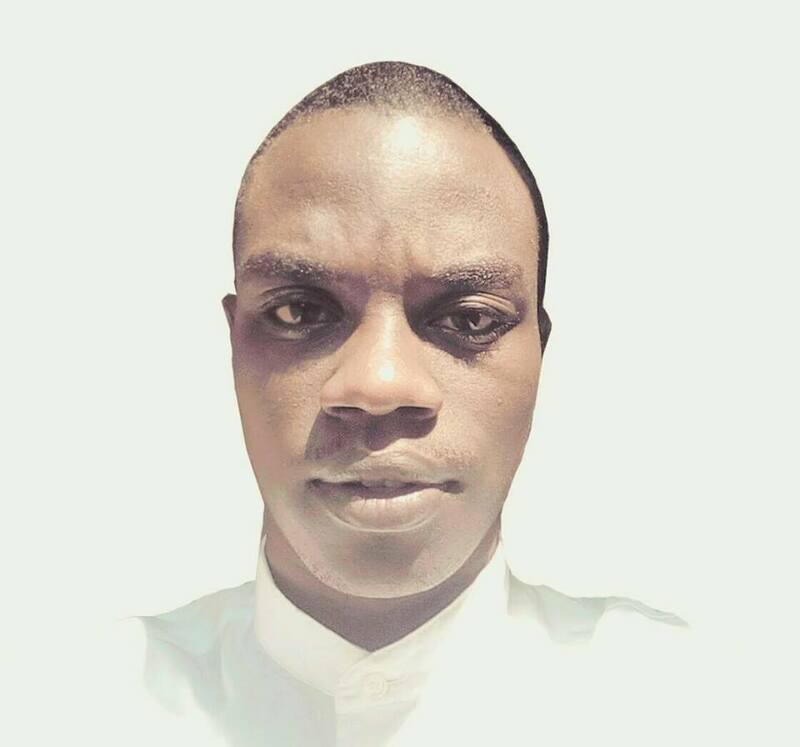 1) Monitoring education roles in developing Africa during pre-colonial, colonial and post-colonial periods. 3) Effect of Awareness rising on Achievable Sustainable Development Goals in Africa on Academic level. 4) Establishing roots for Young academicians on promoting achievements of African Union Agenda 2063. 5) Sustainability of Peace and democracy as key point for African Unity and Development. All abstracts and full paper to be presented in this 2nd AUSC International scientific conference and more detailed requests must be addressed via email: ausc.communication.office@gmail.com to reach the Organizing Committee of the 2nd AAFYC 2018, expecting to get feedback accordingly. Therefore, we welcome submission of abstracts and full papers from today Friday April 13th, 2018, 12:00 a. m GMT, and deadline is fixed on Thursday September 13th, 2018, 12:00 p. m GMT. All abstracts will be evaluated for being consistent to the Main Theme of this congress and focusing on one of the sub-themes published above. 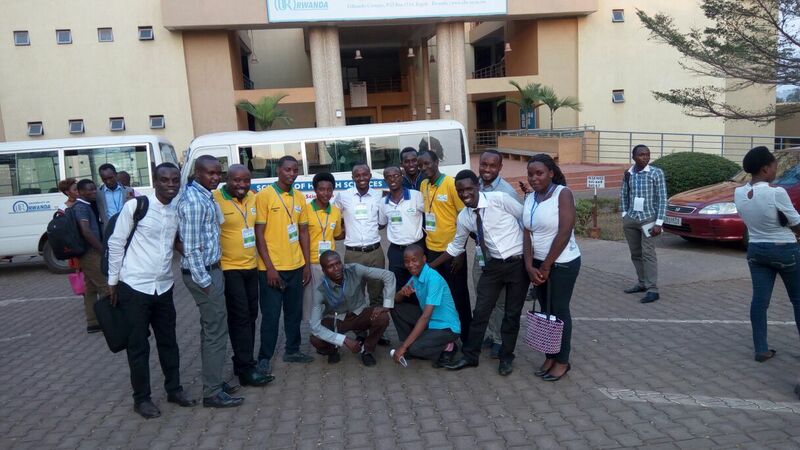 1st category is for non AUSC members who register as students and pay $450 covering accommodation of 3 days, meals, conference materials, tour of Kigali and local transportation for 3 days. 2nd category is for professionals and pay $850 covering accommodation of 3 days, meals, conference materials, tour of Kigali and local transportation for 3 days. 3rd category is for AUSC International Members ( excluding those from East African Community) and pay $300 covering accommodation 3 days, meals, conference materials, tour of Kigali, and Local Transportation for 3 days. 4th category is for AUSC leaders all, AUSC Members and non-members Youth from East African community; they pay $100 covering conference registration and meals for 3 days, excluding Hotel Accommodation and Local Transportation. 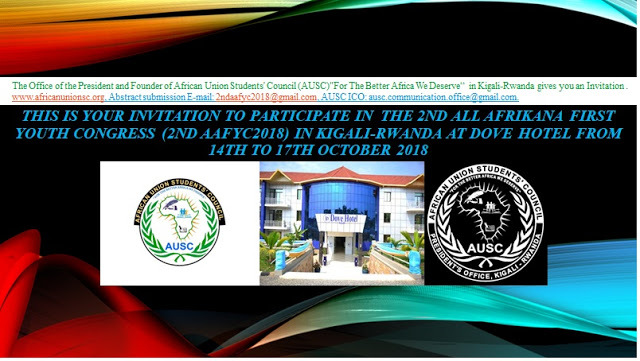 NB 1: AUSC leaders all, AUSC Members and non-members Students from East African community all who register for free or failing to pay 4th category registration fees , can be allowed to attend and not depend on the conference package including Accommodation, meals and Local Transportation. NB 2: Delegates who stay inside Dove Hotel, pays individual consumptions that are not included in the congress package as handed to the Dove Hotel , in order to be accountable for own expenses not mentioned in the registration fees paid for specific categories. NB 3: Other Professionals NGOs leaders and Governments' Officials from Different Countries from across the world, who wish to stay in a different Hotel rather than Dove Hotel, need to inform the Organizing Committee via email: ausc.communication.office@gmail.com, in order to Book for their Rooms before the arrival to the Kigali International Airport. Therefore, whoever willing to donate and contribute to the successful preparation of this 2nd AAFYC 2018, can address it via email: ausc.communication.office@gmail.com , to be accommodated accordingly. You are cordially invited to participate in the 2nd All Afrikana First Youth Congress (2nd AAFYC 2018) from 14th to 17th October 2018 at Dove Hotel in Kigali-Rwanda. Welcome all in Kigali-Rwanda and please share.